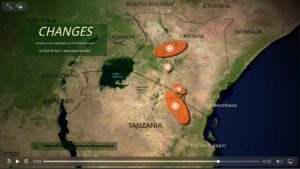 It is our great pleasure to announce the release of the web documentary “Changes” that is based on the insights produced by the Resilience in East African Landscapes (REAL) research and training network. The web documentary constitutes an interactive immersion into the research conducted by the REAL project’s Early Stage Researchers. 12 short video sequences cast light on the complex contexts and consequences of climate change in Kenya and Tanzania and ways of untangling them. The concept of the web documentary and the films were developed by Arghyro Paouri, IIAC-CNRS/ EHESS Paris and Franziska Bedorf, post-doctoral researcher at the REAL project. For more information have a look at the announcement.